Zombies taking over Sin City is the back story to Lost Vegas, a 5 reel, 243 ways to win video slot powered by Microgaming. These blood sucking creatures can deliver instant cash base game bonuses as well as a pair of free spin features. Play from between 30p and £45 per spin. Zombie Fist of Cash feature – this can be triggered following any non-winning spin and awards an instant cash bonus. Blackout Bonus feature – this too can hit after an unsuccessful spin. Here, the reels are scanned and high value symbols revealed. Behind each 1 lies a special bonus prize. An added extra here is that if you land a single scatter you’ll also trigger the Survivor or Zombie Free Spins feature depending on which mode you’re playing in. If you’re playing in Survivor Mode, you can also trigger the Survivor Free Spins feature by landing 3 or more hazard scatter symbols. This feature comes complete with the special Stash feature where the lower value playing card symbols are removed from the reels and bonus prizes awarded. The free spins continue until all the lower value playing card values have been removed from the reels. With higher value symbols dominating, it’s that much easier to create winning combinations. 3 hazard scatters also trigger the Zombie Free Spins feature in Zombie Mode. The extra here is the Infection feature – when a stacked zombie symbol lands, it will infect that reel and turn it wild. Any infected reel can turn single wilds into stacked wilds. Keep spinning until you have infected all 5 reels or you’ve enjoyed 50 free spins. If we had a preference, we’d play in Zombie Mode and go for the Infection feature in the free spins. I’ve had better returns here. As you’d expect from a Microgaming powered video slot, the design in Lost Vegas is impressive. The comic book visuals work very nicely and are a perfect match for the theme. The features stack up well too, offering a nice variety in the base game and feature rounds. The variance here is in the medium range with wins of up to 2,155 times your bet on each spin! 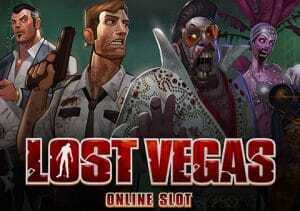 Horror fans will find plenty to like here – even if your zombie love only stretches as far as Shaun of the Dead (now there’s a slot we’d play), the free spins feature make this ghoulish trek to Lost Vegas well worth undertaking. If you like the theme, I recommend Microgaming’s Electric Diva which is highly volatile.